The masked mammal got into a face-off with the woman’s 16-year-old dog. Maureen Blight caught the raccoon in her back garden. 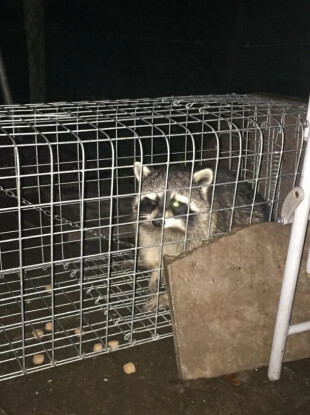 A ONE-EYED raccoon that skulked around a Cork woman’s garden for several days has been captured after being tempted into a make shift trap by bananas and dog nuts. The distinctive masked mammal, which is listed as an invasive species in Ireland, first appeared in Maureen Blight’s garden in Macroom last week. Speaking on the Neil Prendeville Show on Cork’s RedFM 104- 106 today Maureen revealed that she spotted the intruder several times before things came to a head when the “one-eyed gunner” got into a face-off with her “feisty” 16-year-old dog. The Cork woman added that her dog quickly learned her lesson following the showdown. “Of course she chased him down the garden, by god though she wasn’t long turning back,” she said. Maureen’s neighbour, Karen Brennan, captured footage of the animal prowling around and eating dog nuts. Speaking in hushed tones Maureen reveals in the video that the raccoon “listens to everything”. Following the fight the National Parks and Wildlife Services dispatched an officer to the house and a trap baited with bananas was laid in the garden. Maureen said she added some dog nuts into the device because she noticed that the raccoon loved eating them. The animal was trapped on Saturday and was euthanised on Monday night as it is considered a dangerous species. It’s not yet known how it came to be lurking around the Cork town. The first Irish sighting of a raccoon also came in Cork back in 2011. Since then there was another sighting in Cork city and they have also been seen in Dublin and Tipperary. It’s believed that the species arrived in Ireland through the pet trade or trade in animals for zoos. Email “Cork woman uses dog nuts to capture one-eyed raccoon lurking in her garden”. Feedback on “Cork woman uses dog nuts to capture one-eyed raccoon lurking in her garden”.